Often times dreamworld paints paralleled pictures of daytime. Characters differ, scenarios obscured, messages left for interpretation often inviting us to revisit daytime with varying viewpoints. Dreamworld scenarios and characters may differ with energies of the day, surroundings and current state of mind. If we have a bad day, difficulty managing emotions, feeling helpless or joyful day, filled with positive outlook…we change the course of cleansing within constructs of mind: cleansed by fire or gentle clearing of water. Can we fly in dreams? Can we interact within our dreams? Are dreams Lucid? Pay attention to characters and scenes as to what or who they represent in ourselves. Ultimately our subconscious is creating its own painting of how self is perceived. Do we live alone? Share space with others? Near city or jungle? All influence our dreamworld. The difference between battlefields and angelic presence with dreamworlds. We can change that space where we reside through clearing energy fields throughout our daytime. Focusing intent on thoughts and detaching from emotions, cleansing ones spirit. Through clearing the ‘air’ we clear the Canvas for more gentle clearing throughout the night. Our willingness or openness alters vividness or lucidity of our dreams. Engaging in a relationship with dreamworld, allows us to change outcomes in the night. Changing outcomes in the dreamworld, changes thoughts on a subconscious level…altering view by day. While we can do work of change by day, we can multiply these efforts by working in the night. Recently, while staying at a friend’s house, I noticed a most angelic presence. Thoughts were of peace and love, without any thoughts being forced into screen of view. It was subtle, interactive and given meaning of dreams simultaneously before having to ask questions. I am pretty sure recent dreams were in some form copyright infringement, as D.C. comics and Marvel comics were together as one entity. 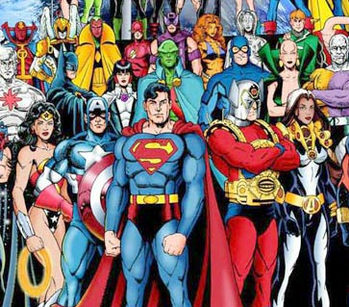 Characters and super heroes from both comics were together acting as one team. While uncertain as to why these super heroes were line up together was not important, but to get my attention to its message. At the bottom of the box we lay in, there was a hose attached to it. When I gave notice to its presence the suction began to take effect. Super Heroes holding onto each other and one by one sucked into this vacuüm like tube. Images briefly go black and we’re returned but in giant forms. Seeing a few super heroes still in the box we realized we were ‘full-size’ and they were still miniaturized. Our suits or costumes torn in the exchange, no longer having a shiny look when miniatures. We were suddenly torn, tattered and worn. Have you ever felt restless through the night, feeling like you didn’t sleep? There are those who can fluidly walk between dreamworlds and realworld, blending two together and blurring lines between such. In doing so, it seems we wake from dreams and fail returning to sleep, while in reality we are still dreaming about not being able to dream…leaving us to process our thoughts on a different level. We’re caught between world of realities. Taking a breath and allowing ourselves to be in that moment as well, we receive a higher message of truth and understanding. The dream began dissecting itself and messages began entering my thoughts. But how can messages enter my thoughts when they arose from my thoughts? Are we remembering? Receiving a download from the universe? or becoming whole, gaining full access to all knowledge? Another thought for another time. So the messages were received and I returned back into the dream. Just as I have done over and over, stepping in and stepping out, then stepping into another dream form as an extension to the earlier. Now walking down a darkened road. Rain had just passed as the reflective lighting glistens off the wet pavement. Stepping carefully heel to toe, taking note as to the yellow center dotted line. With awareness, darkness arose all around. Stepping with intent Light appears from the left, as if light emerging from a darkened past. While light has cleared a darkened past and past has clouded future. Remaining unmoved by either darkness of night or brightness of day, we step further into the Canvas. While one’s interpretation may carry meaning, it may not for another. Left for one’s own discovery. So our miniature super heroes had bright shiny uniforms, faces visible. When sucked into portal and returned to ‘life-size’ their faces were not visible. They clung to one another, avoiding change to happen. One by one sucked into void and returned to larger world. As if pealing layers of self, each character removed from original thought. Once in larger world, our super heroes noticed they were living in a mini village that powered by a hydroponic source. With fish swimming all around, plants and vegetation fed by the waters of life they noticed openings in the shrubbery of miniature village. Each one had a place within the shrubs as if being on display for others to see. These persona witnessed, but are they representation of true-self or made up characters for coping with real-time reality? With ability to step in and step out of dreamworlds/ realworlds, difficult situations/ joyous situations. Whatever our reality, return to road of solitude. Walking with questions and answers in hand, anger and joy balance our reality. With anger and joy balancing our reality we adhere to that lonely road of All there Is. This entry was posted in Active Side of Infinity, self actualization and tagged Ani Po, daily quote, gratitude, inspire, Joseph lieungh, love, quote, self actualization, Stepping into The Canvas, the way, true-self by Joseph. Bookmark the permalink.